Home / Environment / Science & Tech / Green New Deal : Can this plan pushed by some Democrats really work? 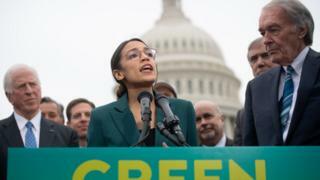 Despite being labelled as a "socialist manifesto", the Green New Deal (GND) on climate change and jobs has sparked a lively debate in US politics. BBC environment correspondent Matt McGrath looks at what's in the deal, and its likely impact. President Trump was quick to thrash the Democrat's new approach to tackling rising temperatures.